We can all stop scratching our heads and wondering what dimension all those lost socks have disappeared to. Dogs are going around eating them in bulk, apparently, because the smell of your feet is just so irresistible (?). At the very least, one Great Dane seems to have an appetite for the foot frockery: Vets found 43 and a half socks in the dog’s stomach. The unnamed dog, who is now named Mr. Hungrypants for the purposes of this story, was brought to the DoveLewis Emergency Animal Hospital in Portland by his owners after he kept vomiting, reports The Oregonian. He’d also lost his appetite, apparently because he’d filled up on ALMOST 44 ENTIRE SOCKS. An X-ray revealed “a lot of foreign material in his stomach,” said a rep for the hospital, and it wasn’t getting digested. 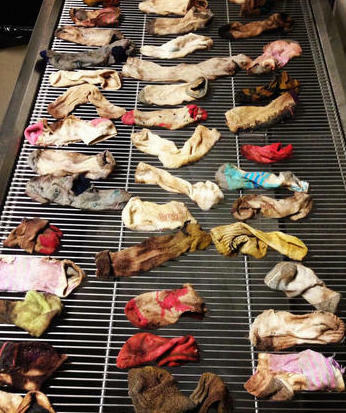 During the three-hour surgery, the veterinarian found all those socks, including the mysterious half sock which no one seems to be able to explain. The pooch’s fame is spreading now with his top three finish in an ongoing contest called “They Ate WHAT?” sponsored by Veterinary Practice News (behind a frog that ate more than 30 rocks and a dog that ate a shish kabob skewer), winning $500 for a fund that goes toward helping people who can’t afford to pay for vet bills alone. And yes, Mr. Hungrypants is doing just fine.